You could just donate money to the Hillary Clinton presidential campaign – but wouldn’t you like to get something in return for your hard-earned cash? Want to get plastered the Clinton way? 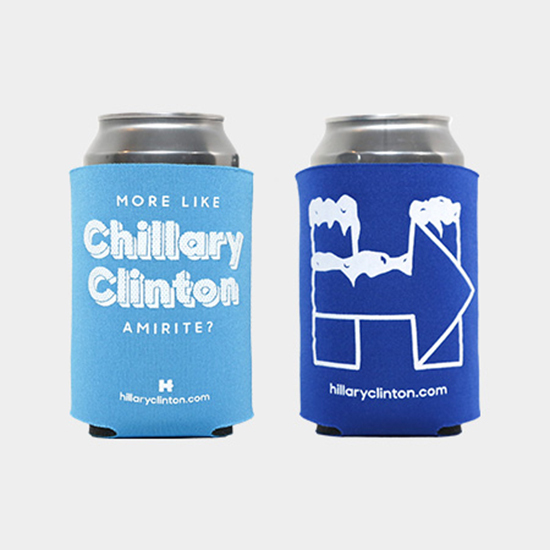 Grab the “Chillary Clinton” beer koozie pack for $10. And crack those brews open with your own “Hillary for America” bottle opener. Or work on your tan with a Hillary Clinton beach towel. It’s only $30 and will guarantee that absolutely no one will bother you while you’re lying out by the ocean. No one. The only bad news is that HillaryClinton.com doesn’t appear to offer any expedited shipping, so you’re probably taking a risk if you want to stock up before Independence Day. But here’s the great news: The 2016 presidential election is still over 16 months away, so you can actually get two summers worth of use out of it before you even have to vote. Ain’t politics great?